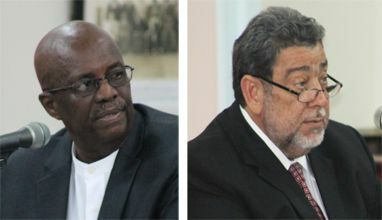 At a sitting of parliament on August 19, Opposition Leader Arnhim Eustace declined to nominate Opposition members to sit on select committees for two bills that were moved by Prime Minister Dr Ralph Gonsalves. For that bill, the Prime Minister moved that it go to a select committee. He nominated, from the Government side: himself, Attorney General Judith Jones-Morgan, Minister of Health Clayton Burgin, Minister of Agriculture Saboto Caesar, Senator Luke Browne, Senator Jomo Thomas. Once again, this bill was sent to a select committee, at which point the Prime Minister nominated himself and the Attorney General, Minister of National Reconciliation Maxwell Charles, Minister of Social Development Frederick Stephenson, Minister of Tourism Cecil Mckie and the Minister of Foreign Affairs Camillo Gonsalves. âI donât know whether the tactic of non-cooperation consists also with this one,â the Prime Minister said, after making his nominations.